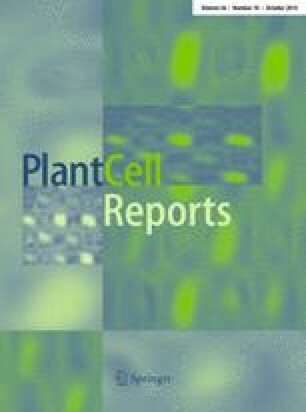 An efficient, reproducible, and genotype-independent in planta transformation has been developed for sugarcane using setts as explant. Traditional Agrobacterium-mediated genetic transformation and in vitro regeneration of sugarcane is a complex and time-consuming process. Development of an efficient Agrobacterium-mediated transformation protocol, which can produce a large number of transgenic plants in short duration is advantageous. Hence, in the present investigation, we developed a tissue culture-independent in planta genetic transformation system for sugarcane using setts collected from 6-month-old sugarcane plants. The sugarcane setts (nodal cuttings) were infected with three Agrobacterium tumefaciens strains harbouring pCAMBIA 1301–bar plasmid, and the transformants were selected against BASTA®. Several parameters influencing the in planta transformation such as A. tumefaciens strains, acetosyringone, sonication and exposure to vacuum pressure, have been evaluated. The putatively transformed sugarcane plants were screened by GUS histochemical assay. Sugarcane setts were pricked and sonicated for 6 min and vacuum infiltered for 2 min at 500 mmHg in A. tumefaciens C58C1 suspension containing 100 µM acetosyringone, 0.1 % Silwett L-77 showed the highest transformation efficiency of 29.6 % (with var. Co 62175). The three-stage selection process completely eliminated the chimeric transgenic sugarcane plants. Among the five sugarcane varieties evaluated using the standardized protocol, var. Co 6907 showed the maximum transformation efficiency (32.6 %). The in planta transformation protocol described here is applicable to transfer the economically important genes into different varieties of sugarcane in relatively short time. Subramanian Mayavan and Kondeti Subramanyam contributed equally. The authors are grateful to University Grants Commission (UGC), Government of India, for the financial support [No.F.31-239/2005 (SR)] to carry out the present work. The corresponding author is thankful to University Grants Commission (UGC), Govt. of. India for providing Fellowship under UGC–BSR scheme. All the authors are thankful to Prof. A.S Rao, Department of Biotechnology & Genetic Engineering, Bharathidasan University, Tiruchirappalli for his valuable suggestions in improving the manuscript.